Maria Sharapova is back—finally. It has been 15 months since she was suspended for testing positive for meldonium. But, it is over. While there are some people who never want her to walk on the court again, she stayed away, she didn’t yell, or get very angry. She just practiced and made sure that she was eating the right stuff. The five-time Grand Slam champion has a tremendous amount of work to do, physically as well as emotionally. She has no ranking. A number of players don’t like her, and some of them want her to fail. If, however, she decides that it is important to become friends with her fellow WTA players, then perhaps they will learn to like her and they will stop ripping her. Believe it or not, when you get to know her, she is very nice, fun and extremely intelligent. Maria to change this time around. She has always been very good, or great, depending on the day. She practices like a maniac, and usually, she pays attention to the little details in her game. She never gives up — we know that —and over the past 15 years, she has improved tremendously. Sharapova is playing in Stuttgart and has won two matches already over Roberta Vinci and Ekaterina Makarova. Next up: qualifier Anett Kontaveit. Rafa Nadal is on fire once again, largely because he’s playing on clay now, and he absolutely loves it. On the hard courts, his legs hurt him a lot, but on clay, it is softer and he can just slide around and dig it out. He won Monte-Carlo (his 10th time) and this week, he is competing on Barcelona. He has won countless times in both places, let alone at Roland Garros. It is coming pretty fast. 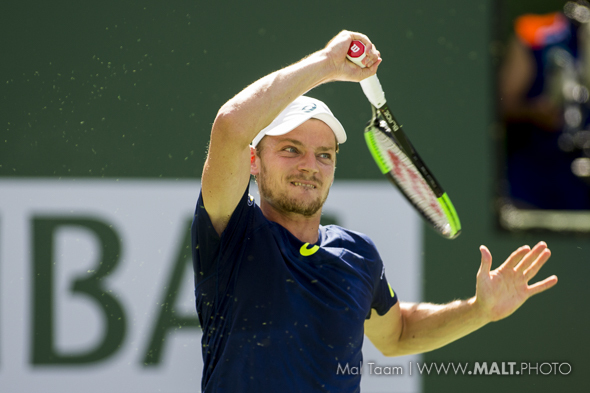 David Goffin is in Barcelona and while the top-10-er has been more consistent over the past year, there are just a couple negative things that hurt him. He has yet to win a big tournament — ever and just lost against the 20-year-old Karen Khachanov. The Russian is rising. Some interesting wins in Stuttgart: Anastasija Sevastova took down Johanna Konta 6-3 7-5, the good veteran Carla Suarez Navarro over Elena Vesnina 6-2 6-4, and the German Laura Siegemund upset Svetlana Kuznetsova 6-4 6-3. 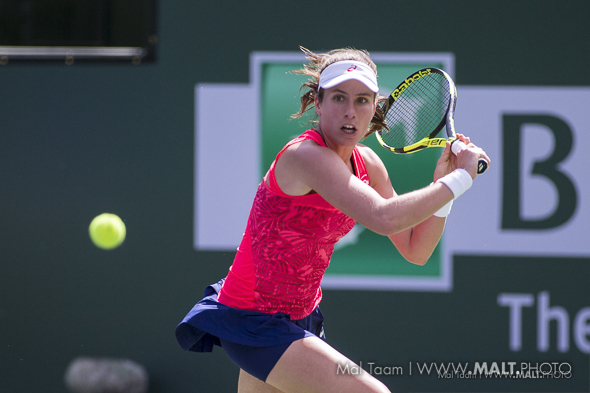 Konta is terrific on hardcourt, but on clay … eh. Serena won’t play this year, so who will be No. 1? The great Serena Williams is pregnant now, and she will not play this year. Or the beginning of 2018. Or never. We won’t find out until the 35-year-old decides if she will want to stay at home, or get on the court to wrap up her career. But that is a different discussion. Now, the other very good WTA competitors will face off and will determine who will end the season at No. 1. It’s only April and they have a long way to go. But, outside of Serena, very few have played fantastic this year. Here is the top 7 players who have a chance to gain, or to stay, at No. 1. The current No. 1 has had a very tough year. Clearly, when she is feeling good mentally, she is so stable and aggressive. However, when she is feeling nervous in must-win situations, she backs up. There is no pressure, except in Germany, where the expectations run high. If she finds her balance, then she will win her third major. Perhaps at RG? Perhaps. At times, she plays so good, with incredible power. But, at other times, her brain melts down. She reached the semis at IW and Miami, which was just fine, but then she went down against Svetlana Kuznetsova and Caro Wozniacki. Not bad, but not great. The now No. 3 almost won the 2016 US Open, but right at the end, she was not comfortable. She can snare No. 1, but in order to do so, she has to win her first major. Maybe on hardcourts at the US Open. The No. 4 has improved a lot over the past three years. She may be small, but she is so strong and rarely gets tired. She has gone deep at all four majors. She did reach the final at the 2014 Aussie, but couldn’t grab it (against Li Na). She hasn’t done much this year, but soon, she will rise. Can she win a Slam? I doubt it. At times, she has been so close to winning a Grand Slam, but she has can’t put together a perfect two weeks. This year, the No. 5 has been really struggling, not because she is injured, but because her focus is through glassy eyes. In 2014, she reached the final at Roland Garros. She ran and ran and ran and was trying to exhaust Maria Sharapova, but in the last two games in the third set — over three hours — Sharapova went for it, while Halep just stood there and lost. The Romanian can reach the final at RG, and this time, she will win it for the first time. The positive is that last year in the 2016 Roland Garros final against Serena, the No. 6 Muguruza was super aggressive and accurate. She won the title, she was so happy and smiled for months. Except she hasn’t won a tournament since then. Yes, she loves clay, but she gets injured a ton. If the Spaniard begins to feel healthy, she can get on a roll. For sure, she wants to win RG once again. The Brit improves week after week and at Miami, she beat Halep, Venus and Wozniacki to win it. She was ultra-aggressive off both sides. In the past two years, the No. 7 has changed her outlook and if she continues upwards, she can win either Wimbledon and/or the US Open. But she has continue to improve her consistentency. There were many, many years that the Pole was ready to win a Slam, but for whatever reason, towards the end, her forehand and second serve were too weak to carry her to victory. Obviously, her backhand is fantastic, as is her wonderful speed and various shots. But, she has played poorly this season. The No. 8 does not seem happy, which means that unless she turns it around in rapid speed, then she will fall further. The five-time Slam champion Maria Sharapova will return next week after spending 15 months suspended after doping. Yes, as she said, she messed it up, but she loves tennis and even though many players will crucify her, she still will try as hard as she could. The former No. 1 always will. Another former champ, Vika Azarenka will come back in July after having her first child. She has been No. 1, and she will be once again. She is very intense and she has matured a great deal. The No. 11 Caro Wozniacki is playing much better this year, but once she reaches the final, she gets very nervous. If she can take a deep breath, then maybe — and I mean maybe — the former No. 1 can finally win a major. The 19-year-old Russian Kasatkina won Charleston, and she looked extremely confident, smoking Jelena Ostapenko in the final. She didn’t have to best the top-20 players, but at the very least, she was very steady and precise. Will she crack the top 10 at the end of the year? Maybe not, but she is very young and driven. The Latvian looked a little tired at the final, but she did score a couple very good wins: upsetting Caro Wozniaki and Mirjana Lucic-Baroni. She is also only 19 years old, and in 2014, she won junior Wimbledon. She is learning all the time. This duo is ranked No. 1 (Mattek- Sands) and No. 2 (Safarova) won Charleston, beating Lucie Hradecka/Katerina Siniakova. 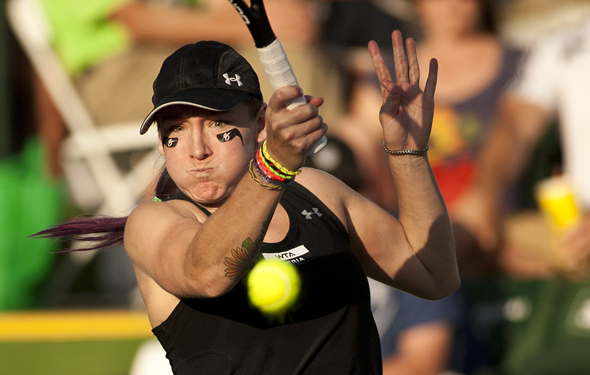 Both Mattek-Sands and Safarova are consummate veterans, and while they don’t exactly love clay. In six weeks, they will enter Roland Garros, and maybe, if they can be calm and composed, they can win it all. ‘Pavs’ has been playing for 10 years. Somedays, she plays great and she is enthusiastic. Other days, her brain was fried. 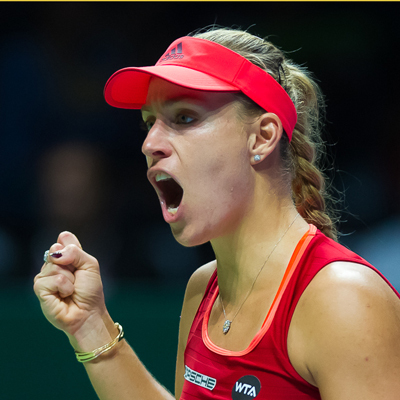 In Monterrey, Mexico, she was on the ball, defeating Angelique Kerber in the final. That was the third time that the No. 16 won Monterrey. She must love the food. Without a doubt, sometime soon she will be very close at the Grand Slams. Yes, the German reached the final, beating two good players: the former champ Francesca Schiavone and the owner of a terrific one-hander Carla Suarez Navarro. But the No. 1 Kerber hasn’t won a tournament since the 2016 US Open, seven months running. Time to figure things out. The 20-year-old led Australia in beating the US, knocking out the vets John Isner and Sam Querrey. He is much more comfortable in the Davis Cup than on the ATP World Tour, being aggressive and smart. The Aussies could actually win it all this year, but they need to bring back Bernard Tomic to help them. If he is actually playing, that is. The Belgium plays Davis Cup all the time, year after year. They beat Italy 3-1 Given that Goffin has improved a lot recently, maybe they can upset Australia at home and actually reach the final. Perhaps, if he can kiss the lines in September, that is. Yes, Novak Djokovic won his match, but Troicki was confident in singles and doubles. They whipped Spain. If the No. 2 Djokovic decides not to play right after the US Open ends, then Serbia has no chance to win the Cup again. They do not have enough great players to prevail without him. The top 3 men couldn’t play because of injury, so France brought in a bunch of fine competitors. France has so much depth. Four players cracked England: Lucas Pouille, Jeremy Chardy, Julien Benneteau and Nicolas Mahut. The new captain was pretty brilliant, upsetting the Americans by helping Nick Kyrgios and Jordan Thompson. They were super solid, just like Lleyton was when he played, year-in and year-out. Yes, the 35-year-old put together his best performance to win the 2017 Aussie Open, Indian Wells and Miami. At the start of the year, no one thought that he could go back-to-back-to-back when he was aging. But he did, and now, he is the best player of all time. Hopefully this year, he will not get hurt again. Everyone wants to see him play. If you happen to be in Paris, go out and watch him. Eventually, he will have to retire. But not this year. The Spaniard has changed a little bit, being a little more aggressive with his backhand down the line and coming into the net. He is trying to mix it up more, which is good, and hopefully, the next time he plays Federer this year, he can out-hit him. In Roland Garros that it, because Federer won’t play again until late May. The 20-year-old Aussie had a terrific tournament, nearly beating Federer in three very long sets. He is young and he is improving each week — if he continues to pay attention and be more focused on court. For the first time, the talented Italian reached the semis in Miami, looking good, mixing it up and pushing himself into the net. Hopefully, he won’t be a one-off. The teenager is now ranked No. 20 and he is improving in every tournament he plays. Venus Williams and Caro Wozniacki. That is good as it gets — except for getting a victory over Serena, who is injured. Someday soon, the No. 12 Caroline will win another big tournament again, but she needs to change it up even more. She has to continue to improve her forehand and come into the net once in a while. Regardless, Caro did well in March. The 36-year-old Venus is always out there trying as hard as she can, but her second serve is pretty weak and she isn’t as fast as she used to be. Still, she’s back in the top 10, which is admirable. Pliskova is very confusing. She is so strong and aggressive; she works and plays all the time. But somedays, she gets loses her mental focus and then, she is gone. Lucie Safarova is coming back strong. The former No. 5 took out Dominika Cibulkova and reached the quarters. The 18-time champ knew that the only way he was going to consistent knock down the other top players (Nadal, Andy Murray and Novak Djokovic) is to go more forward, meaning that he had to leap upwards, instead of being way back behind the court. For many, many years, the lefty Nadal would just continue to pound into his backhand with his heavy topspin. Federer really didn’t know what to do. Once in a while, he would jump up and crack it down the line and hit some winners. But Nadal didn’t care; he was pretty sure that, eventually, he would watch Federer grow angry. Then, he would become comfortable and settle in for the win. At the start of this year, Nadal had won 23 matches against Federer, who won only 11. Believe it or not, in 2017, Federer hadn’t won a major against Nadal since 2007, when the Swiss had taken down the Spaniard in five sets at Wimbledon. Rafa was only 20 years old then. But very quickly, he knew exactly what to do. After that, Federer couldn’t understand why Nadal wasn’t going to chip and charge, or push the ball in the center of the court, or challenge his forehand. He just pounded and pounded and pounded till Federer’s grew frustrated in his one-handed backhand slice. Nadal beat him at 2008 Roland Garros (on clay), 2008 Wimbledon (on grass), 2009 Australian Open (on hard courts), 2011 RG, 2012 Aussie Open and the 2014 Aussie Open. Rafa had beaten Roger six times in the Slams. Now, Federer is 35 years and Nadal is 30. In the summer of 2016, Roger was pretty hurt and, after he lost early at Wimbly, he called it a year. He was tired and his body was breaking down. Fortunately, Federer got better, his knees were better, and he missed playing tennis. Enter Ivan Ljubicic, the former player and now his coach, really helped Federer. They practiced and practiced. When Federer was prepared to play again, he was ready to go. His phenomenal serve, forehand, return, the net, variety, lobs … Almost everything, except for his backhand. But it was right there. Finally, Federer went on court in the final of the 2017 Aussie, and he shocked Nadal 6-4 3-6 6-1 3-6 6-3. Nadal was up 3-1 in the fifth set, and we could tell that Federer was much more powerful and directed. 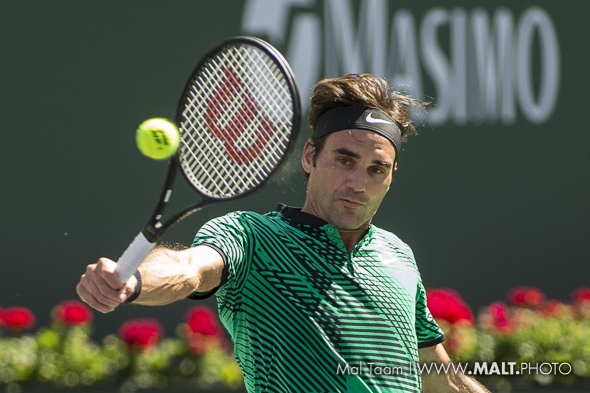 Six weeks later at Indian Wells, Federer crushed Nadal 6-2 6-3. Now, Federer is incredibly confident once again. But hold on. In Miami this week, he won two fantastic contests, but they were very, very long. 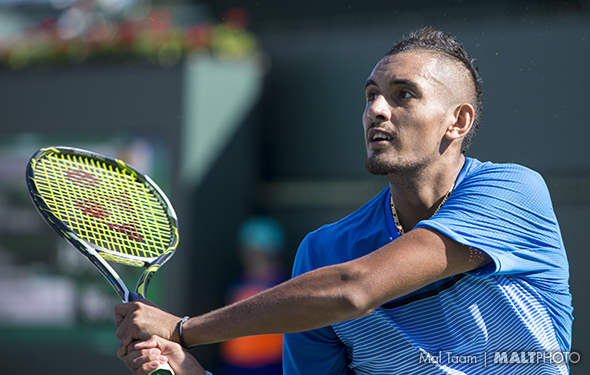 He beat Tomas Berdych 7-6(6) in the third, and in the semis, he ended Nick Kyrgios 7-6(5) in the third. We would think that Federer is a little bit tired, no? Look, Federer did get a day off. But on Sunday, if he is forced to get into the third set — let’s say after two hours— then Rafa will win. Nadal isn’t tired at all, as he easily whipped Jack Sock and Fabio Fognini. Without a doubt, Nadal has to improve over the next few years because he hasn’t won a Grand Slam since 2014. Rafa’s backhand can be weak, and he doesn’t come into the net enough. Regardless, Nadal is pretty pissed off and he wants to win a big event right now. He will run and run and run, and best Federer in three fun sets. A couple years ago, it was hard to see Konta, now 25 years old ,reach the top 10, much less win a big event. She did today, out-hitting Caro 6-4 6-3. She is so powerful, so aggressive … and she rarely backs off. Now the Brit is ranked No. 7. Perhaps this year, she can win a major, if she continues to improve. But, at Wimbledon when the pressure is on? We will find out in the next few months is she’s prepared for that accomplishment.